As I drive around the area I am constantly drawn to looking at chimneys, it is I suppose an occupational hazard of being a chimney sweep! 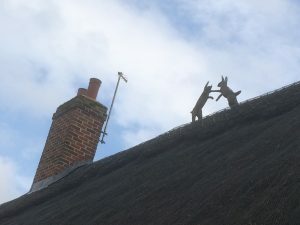 However, it does occasionally have some happy consequences; for example, just the other day I saw these ‘mad March hares’ boxing on a thatched roof in Stoke by Clare which caused me to smile and think of all the other signs of spring that are now fast emerging all around us. It then struck me that if these hares are made of straw, does that make them thatch animals, or ‘thatchamals’ for short? I know one thing for sure I will now be on the lookout for more thatchamals whilst on my travels.